The demise of the Soviet Union was concurrent with a decline in its economic power, and it could no longer afford to provide support for its allies in Latin America. It also saw little reason to do so, given that Boris Yeltsin’s government looked to work with Western regimes and did not want to alienate them through further support for elements antagonistic to the United States. Therefore, Russia largely withdrew from the region throughout most of the 1990s, as it was not a priority for the struggling nation. Thus, its influence in Latin America declined. In the late 1990s, Russia’s relationship with Latin America began to change, and Russian diplomats increasingly found a presence in the region. In 1997, then-Minister of Foreign Affairs Yevgeny Primakov traveled throughout Argentina, Colombia, Brazil, and Costa Rica, and spoke of the importance of an alliance between Russia and Latin America to create a multipolar world. The previous relationship between Russia and Latin America, based mainly on similar ideological leanings, has quickly evolved, and is now characterized as one aiming to promote tangible economic and political benefits for both parties in line with Putin’s worldview. After the demise of the Soviet Union, Moscow’s geopolitical efforts focused on defending its claim to a “sphere of privileged interests.” Then-US president Barack Obama dubbed Russia a “regional power,” given that these “privileged interests” were concentrated in Russia’s periphery. However, since Vladimir Putin assumed the Russian presidency in 2012, Russia has taken on a campaign to influence political systems globally and expand Russia’s reach. Putin hopes to achieve this multipolar world order through a blend of diplomacy, military action, intelligence, energy, and trade. His objectives consist of undermining the United States and the European-led international order and its cohesiveness; furthering Putin’s legitimacy domestically by raising Russia’s profile on the world stage; promoting military, commercial, and energy interests; and encroaching on regions traditionally under the United States’ influence. First, Russia looked to undermine the Western and transatlantic institutions that it views as its adversaries: The United States, the European Union, and the North Atlantic Treaty Organization (NATO). The Kremlin’s security establishment generally holds the view that the previous US administrations actively attempted to weaken Russia both domestically and internationally, and increase its isolation. Russia is looking to do to the West what Russia believes the West has done to it, and thus has made attempts to exploit any internal tensions within these organizations. The most relevant and consequential example is Russia’s attempt to exploit the United States’ “America First” foreign policy under Donald Trump, which presents an opportunity for Russia to fill power vacuums left by the US. Russia has attempted to expand its influence in Latin America, Asia, and Africa, some of which involve creating coalitions with emerging powers to rival the international system dominated by the West. Efforts in Latin America involve fostering relationships with authoritarian leaders and taking advantage of conflicts between the United States and its traditional partners. By becoming a more dominant presence in Latin America, Russia hopes to challenge the US’s historical sphere of influence, and to counter US attempts to bring former Warsaw Pact states into NATO. Russia looks to impose its own will on former states of the USSR on its periphery, and counter the influence of the West; it is essentially looking to create “pro-Russia” buffers. This is exemplified by Russia’s aggressive actions toward Georgia, Moldova, and Ukraine, countries formerly under the Soviet sphere that are increasingly looking westward. Moscow has used its propaganda arm to influence these regions, and has made attempts to undermine their political transitions and prevent any integration with the West. One also cannot discount the benefits that Dmitry Medvedev, president of Russia from 2008 to 2012, and Putin derived domestically in terms of popular support. Russian military activities in Latin America, as well as economic projects and diplomatic efforts with Latin American leaders, demonstrate Russia’s international influence to the Russian public, thereby promoting a sense of pride in the citizenry. For example, Putin’s increasing engagement in Latin America showed to the Russian people that Russia was playing a prominent role on the world stage, and that his actions in 2014 in Ukraine did not fully isolate Russia internationally. The Bolivarian Alliance for the Peoples of Our America, or Alianza Bolivariana para los Pueblos de Nuestra America (ALBA), founded to promote Latin American political and economic integration, has been a key ally to the Russian government, having ties with Moscow dating back to the Soviet Union. The nations of ALBA, which include Venezuela, Cuba, Nicaragua, and Bolivia, have a similar perspective to that of Putin’s government; they view the United States as having imperialist ambitions and a willingness to interfere in the governments of Latin America. This is not unwarranted, since the US has a history of orchestrating coups and supporting dictators in the region. The member states of ALBA, however, have been perceived as authoritarian or repressive, and at times have allied themselves with governments antagonistic to the United States, such as North Korea, Syria, Zimbabwe, and, of course, Russia. Additionally, ALBA supports organizations listed by the United States as terrorist, such as Hezbollah, the Basque separatist group ETA, and the Revolutionary Armed Forces of Colombia (FARC). ALBA and Russia mutually benefit because they can, through Russia, veto any efforts in the United Nations Security Council to hold their governments accountable for human rights violations and/or electoral fraud. The Soviet Union had maintained economic relationships with a number of countries in Latin America beyond verbal support. For example, it relied on food sales from Argentina and Brazil, despite their conservative governments, when the United States cut off grain sales. The USSR additionally conducted hydroelectric power plant projects in Colombia, Brazil, and Mexico, and irrigation programs in Venezuela and Peru. Moscow’s re-entry into the region after the fall of the Soviet Union came with a shift in its economic designs, consistent with Russia’s new post-Cold War economic restructuring. Russia looked to focus on the industries leading its economy that would address its internal needs and foster its global ascendance: arms, petroleum, electricity generation, and mining. It was within this context that Venezuela became an integral part of Russia’s re-engagement in the region. Moreover, throughout the 2000s, the governments of Russia and Venezuela became closer through a series of arms agreements, as Venezuelan president Hugo Chávez saw an alliance with Russia as a counterweight to the US presence in the region. The lynchpin of cooperation between Russia and Venezuela was forged in July 2006, when Chávez signed an arms deal with Russia for $3 billion, purchasing 24 Sukhoi-30 attack aircrafts, 53 military helicopters, and in return receiving Russia’s aid in building various arms factories within Venezuela. Shortly before, Venezuela had agreed to purchase 100,000 Kalashnikov rifles from the Russians. This deal went through only weeks after the United States banned American weapon sales to Venezuela, depriving it of spare parts for F-16 fighter aircrafts previously acquired from the US. The United States took these measures due to Venezuela’s ties to the FARC in Colombia as well as the governments of Iran and Cuba, and the suspicion that Venezuela was acting as a transit point for arms and individuals threatening to the United States. US State Department spokesperson Tom Casey echoed this sentiment, stating “the arms purchase planned by Venezuela exceeded its defensive needs and are not helpful in terms of regional stability.” Chávez, on the other hand, asserted that these purchases were necessary for self-defense. “The Russians are going to install a Kalashnikov rifle plant and a munitions factory so we can defend every street, every hill, every corner,” Chávez stated. “The United States is failing in its attempts to blockade us, to disarm us”. His rhetoric in this instance captured the essence of his animosity toward the United States and his friendliness toward the Russian government. Venezuela again made itself available to Russia against the backdrop of the 2008 crisis in Georgia, a former soviet state. Russia supported the republics of Abkhazia and South Ossetia in their desire to break away from Georgia and become independent. However, neither the United States nor Georgia supported their cause. The US brought its navy to the Black Sea during the conflict. Russia responded by sending Tu-160 bombers to Venezuela and deploying a four-ship Russian naval flotilla to first conduct joint military exercises with the Venezuelan navy and then make port calls to Cuba and Nicaragua. This was a reminder of Russia’s military capability, and its ability to strike the US with nuclear weapons. “The Yankee hegemony is finished,” Chávez was reported to have said. In threatening the US in its “backyard,” Russia hoped to divert US resources going into winning over Russia’s traditional “sphere of influence” on its periphery. This was also significant in that it marked the first time the Russian navy had returned to Latin America since the Cold War, and the fact that Chávez demonstrated his willingness to act beyond anti-US rhetoric and receive Russian armed forces that would pose a threat to the United States, and even potentially elicit military action from the Western powers. Venezuela maintained this openness to Russian military forces. In March 2009, Chávez announced that he would allow Russian strategic bombers to be based in Venezuela despite US concerns. Most recently, following Maduro and Putin’s meeting in December 2018, strategic bombers (Russian Tu-160 “White Swans”) landed in Caracas, the Venezuelan capital. This took place in light of the US’s recent decision to pull out of the Intermediate-Range Nuclear Forces (INF) Treaty between the United States and Russia (Russia and the US accused each another of non-compliance). For the past three decades, this treaty had prohibited the deployment of medium-range nuclear missiles and prompted the destruction of over 2,600 missiles, keeping the European continent free of these weapons. According to HIS Markit analyst Diego Moya-Ocampos, Russia’s recent deployment of Tu-160s shows that Russia is “trying to force the US to say, ‘listen, if you withdraw from this and if you make these moves in Europe, we will make these moves as well”. Venezuela’s purchase of Russian arms has gone hand in hand with Venezuela’s friendliness with the Russian military. In September of 2009, Chávez agreed to buy short-range missiles from Russia, which would be in range of the US presence in Colombia, Aruba, and Curacao. This was due to Chávez’s discomfort with US military activity in neighboring Colombia, and so the president stated the missiles were “defense tools, because we are going to defend our country from any threat, wherever it may come from”. Venezuela was the top client for the Russian arms industry in Latin America between 2001 and 2013, purchasing over 11 billion USD worth of Russian weapons. Russian arms sales made up 69% of Venezuela’s imported arms purchases. In fact, Venezuela purchased so many helicopters from Russia that the Russian company, Transas, decided to open a regional center for helicopter instruction in Venezuela. As Venezuela’s economic crisis worsened, government purchases of Russian military equipment decreased, and the relationship between Venezuela and Russia became increasingly centered on transactions within Venezuela’s energy sector. Russian oil companies were able to take advantage of the favorable political conditions between the two countries to conduct their business. At first, Russia had provided Venezuela with loans guaranteed with Venezuelan oil sales. Soon, however, deals between the two countries became increasingly complex. Russia demanded more real assets as guarantees, and Venezuela complied by providing Russian companies with shares of Venezuela’s oil companies and giving them rights to Venezuela’s oil fields. During the 1950s, Venezuela had one of the highest GDPs per capita in the world. A rentier state throughout most of the 20th century, Venezuela today has the largest oil reserves in the world at 300 billion barrels, surpassing even Saudi Arabia’s. In 1982, Venezuela had the wealthiest economy in Latin America, using oil revenue to fund social programs and subsidize health care, transportation infrastructure, food, and education. Its workers were some of the highest paid in Latin America. According to OPEC, oil currently accounts for 95% of Venezuelan exports, and these oil exports make up a quarter of the country’s GDP. Fortunately for Venezuela, from 2005 to 2014, oil prices recovered, and were high enough so that the country’s revenues could be channeled into welfare programs. Unemployment rates were cut in half and poverty rates substantially decreased. The infant mortality rate also declined. Global oil prices soon crashed, however, falling from $111 per barrel in 2014 to $27 per barrel in 2016. That same year, Venezuela’s GDP dropped by ten to fifteen percent. The state budget experienced a deep deficit, and the government, then under Maduro, responded by printing more money to be able to compensate workers and continue to fund welfare programs. This monetary approach triggered the hyperinflation we are seeing in Venezuela today. According to the International Monetary Fund, prices are currently rising with an annual inflation rate of around one million percent. Venezuela’s foreign exchange reserves are dwindling. These reserves peaked at $42 billion in 2009 and have declined to less than $9 billion today. This decline has made it more likely for the government and PDVSA, Venezuela’s state oil company, to default on foreign currency loans, not only losing Western creditors, but also putting Russian and Chinese interests at risk. Venezuela’s economic woes have had far reaching and devastating consequences. Countless lives have been lost in what is considered a public health and humanitarian crisis. The Venezuelan people have not had access to basic amenities, with hospitals in utter disrepair, unable to provide basic services. “It is like something from the 19th century,” said Dr. Christian Pino of the University of the Andes Hospital, in response to a number of calamities, like a shortage of antibiotics and increasing mortality rates for newborns and their mothers. Poverty has skyrocketed and malnourishment among children has become increasingly common. Violence has also become a major problem in Venezuelan society, and, while Maduro has pledged to use the military to combat crime, various human rights groups and foreign media outlets have reported abuses and even extra-judicial killings. Venezuela’s economic crisis has largely scared away foreign creditors. US-imposed sanctions and economic mismanagement has made Venezuela more vulnerable than ever. China had been Venezuela’s main foreign lender, but Russia has become increasingly influential, given Medvedev and Putin’s efforts to cultivate relations with Chávez and Maduro for both geopolitical and economic reasons. China also has withdrawn somewhat from its previous economic relationship with Venezuela, given the volatility of the region and the unlikely repayment of Chinese loans. Russia has stepped in and become Venezuela’s lifeline, its lender of last resort, increasing Venezuela’s reliance on Russia. In fact, in November 2017, the Russian government came to the rescue of Venezuela, which had recently been declared by credit rating agencies to be in default on international bonds worth more than 60 billion USD. Moscow announced an agreement for the restructuring of 3.15 billion USD worth of sovereign debt, allowing Venezuela to repay the money over a ten-year period. This would not only free up cash and allow Venezuela to meet shorter-term debt obligations, but also allow the country to look to creditors apart from traditional Western economic powers within the Paris Club and IMF. Venezuela has already been denied the ability to borrow from the banks of the United States and Europe to try to refinance or pay off its debts. Maduro’s dealings with the Russian government not only kept Venezuela from defaulting, but also helped Maduro maintain power. The opposition, though heterogeneous, was united in its belief that Maduro’s policies were ruining the country, and the Venezuelan leader was therefore at risk of being deposed. Maduro had looked to keep a potentially discontented military at bay, and the arms deals struck with Russia legitimized him as a leader in their eyes. In July 2017, Maduro created a legislative body called the Constituent Assembly, which would give him virtually unlimited power. This action received international condemnation. Maduro’s allies won all 545 seats, giving them the power to rewrite the Venezuelan constitution and eliminate state institutions, such as the opposition-dominated National Assembly, and even fire state officials considered dissidents. The majority of officials comprising the National Assembly had opposed oil deals with Russia and wanted to keep the power to veto them. The need to secure Russian loans was one of Maduro’s motivations in creating this new legislative body. Russia has been one of the few international players to support him politically, endorsing Maduro’s dissolution of the National Assembly while the United States, Colombia, and Brazil refused to recognize the newly formed Constituent Assembly. In superseding the National Assembly, the Constituent Assembly grants Maduro the power to make deals with Russia without needing the approval of legislators. Coming to power in 2000, Putin felt he needed to counterbalance the influence of Russian oligarchs and reassert state control. Given Putin’s thesis that Russia’s economy should grow by exploiting its natural resources, the development of Rosneft as a successful oil company was crucial. He supported initiatives to prop up Rosneft as a major player in the domestic and international economy, and thus further establish Russia as a leader in the global oil industry. Despite partial privatization of the company, the Russian government remains the majority owner, with a 50% stake. Rosneft issued an initial public offering in 2006 to be traded on the London Stock Exchange, with a total placement value of $10.7 billion, making it the largest of Russia’s companies. Thus, Rosneft’s dual position of being a partially private company but also at the disposal of the Kremlin allowed it to mediate between private oil companies and the state authorities responsible for the regulation of Russia’s oil industry. By 2007, Rosneft had become Russia’s largest oil producer. As Russia’s national oil company, it was able to receive tax cuts and preferential access to new resources. It also assumed additional responsibilities, such as contributing a significant portion of its profits to social programs and investing in politically significant regions, such as in the Caucuses after the war with Chechnya. Thus, Rosneft became not only a profitable enterprise, but also a geopolitical instrument. After the global financial meltdown in 2008, Russia began to expand investment in Venezuela’s energy sector, seeing opportunity in Venezuela’s vast oil fields. In October 2008, Russia’s largest energy companies—Rosneft, Gazprom, Surgutneftegaz, Lukoil, and TNK-BP—formed the National Oil Consortium (NOC) to consolidate previously separate efforts to exploit oil fields in Venezuela. In 2010, NOC and PDVSA began the PetroMiranda Joint Venture, which aimed to develop the massive Junin-6 oil field of reserves, which could yield more than 50 billion barrels of oil. Venezuelan law required that 60% of the project be owned by a subsidiary of PDVSA called Corporación Venezolana del Petroleo (CVP), with the other 40% held by the NOC. It was not long, however, before Rosneft consolidated its position in the region, and became the only company actively investing in Venezuela within five years of the NOC’s formation. In 2014, Russia suffered through a collapse in oil prices and economic sanctions from the West. Following Russia’s annexation of Crimea and military activity in Ukraine’s Donbas region, the United States and Europe placed various sanctions on companies and individuals operating in Russia’s financial, defense, and energy sectors. Western oil companies had to abandon projects with Russian oil companies, like Rosneft, thus depriving them of much-needed expertise from companies such as BP Plc and ExxonMobil. The sanctions were hard-hitting because they were “designed to effectively shut down this type of oil exploration and production activity by depriving these Russian companies of the goods, technology and services that they need to do this work,” according to an anonymous senior U.S. official. ExxonMobil, for example, was forced to give up a $720 million joint venture with Rosneft for hydrocarbon drilling in Russia’s Arctic Sea. This forced Rosneft to look to new oil fields as replacements for its reserves and thus turn to places like Latin America, particularly Venezuela. Venezuela, Cuba, and Bolivia had declined to vote in favor of the UN resolution, condemning Russia’s actions in Crimea, making them even more viable as partners in the region. Among the Russian officials sanctioned by the United States in 2014 was Rosneft CEO Igor Sechin, a further blow to Rosneft’s activity. Rosneft, already suffering from the worldwide drop in oil prices, was also in major debt from its rapid rounds of acquisitions in the early 2000s. Instead of focusing on repairing its balance sheet and waiting for better and more stable economic and political conditions, Rosneft instead looked aggressively to expand its international business. “Taking into account the future decline of shale production in the U.S. and Canada, it is Venezuelan oil that can become the substitutional element for the receding volumes of those markets,” Sechin stated in December 2014, after Rosneft’s stake in the NOC rose to 80%. Venezuela’s economic volatility makes it difficult to view Rosneft’s activities in the country as ones that are purely profit-oriented. Given the risk, the returns on any investment made in the region would have to be extraordinarily high in order for the investment to be worth making. Rosneft’s activity in Venezuela somewhat reflects the developments of 2014, specifically Putin’s broader geopolitical strategy and how Venezuela’s failing and heavily indebted economy might have a role to play. Venezuela provided Rosneft with stakes in oil and gas projects at a deep discount. The following year, Rosneft and PDVSA came to an agreement where over 1.6 million tons of oil and 9 million tons of oil products would be supplied from Venezuela to Rosneft within five years, and Rosneft would put in 14 billion USD worth of investment into Venezuela’s energy sector. In February 2016, Rosneft and PDVSA struck a deal to increase Rosneft’s stake in Venezuelan crude oil producer Petromongas JV to 40%, and in December 2016, Rosneft took a 49.9% share of Venezuela’s state oil refining subsidiary in the United States, Citgo, as collateral for a 1.5 billion USD loan to PDVSA. Venezuela then used the money to pay bills and keep its oil fields in production. In December 2017, Rosneft was given a license to develop the Patão and Mejillones gas fields offshore. Putin’s hopes of legitimizing Russia on the world stage and gaining domestic support have greatly impacted Venezuela, which is providing an outlet for Putin to fulfill his aims. Putin has mobilized Russian military forces in Venezuela in retaliation for US interventions in what Russia considered its own affairs and other actions that have negatively affected Putin’s international ambitions. The most recent example is Russia’s deployment of “White Swan” bombers in Caracas following the US withdrawal from the Intermediate-Range Nuclear Forces Treaty. Venezuela has benefited from this relationship with Russia given that it too has an antagonistic relationship with the United States and hoped to deter an invasion. Arms deals with Russia in the 2000s came after the US cut off weapons exports to Venezuela, which Chávez claimed were necessary for the country’s self-defense. Given the proximity of US military bases to the South American continent and the deteriorating relationship between the two nations, Chávez felt an ever-increasing need to bolster the military. Venezuela is also in dire need of creditors and investment due to the oil crisis. The country has been embroiled in social turmoil brought about by rampant inflation and lack of food and supplies, so it has looked to Russia to provide loans in exchange for preferential access to their oil fields. This has yielded a multitude of joint venture projects between the US-sanctioned Rosneft and PDVSA. Also, the recent petro cryptocurrency project is an attempt to circumvent sanctions on Venezuela and undermine the US dollar. The nature of the relationship between Russia and Venezuela extends beyond any attempt to defy the United States. Russia and the ALBA voting bloc are able to help prevent the UN Security Council from punishing their governments for human rights abuses or electoral fraud. 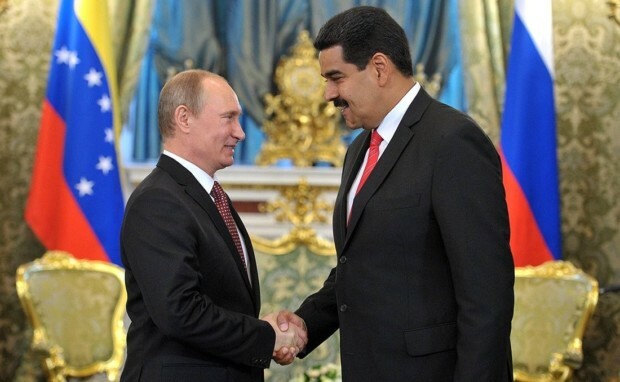 Both Maduro and Putin derive domestic benefits from their relationship as well. Russian activity in Latin America can be advertised as evidence of Russia’s preeminence geopolitically, while for Maduro, arms deals legitimize him in the eyes of the military. Ultimately, Venezuela and Russia are natural partners in challenging the Western-dominated world order, and their mutually-beneficial relationship supports their leaders’ aims. Allen, Kate, Henry Foy and John Paul Rathbone. “Russia and Venezuela agree $3bn debt restructuring.” Financial Times. November 15, 2017. Blomfield, Adrian. “Chavez in Russian Arms Factory Deal.” The Telegraph. June 1, 2006. Casey, Nicholas. “Venezuela’s New, Powerful Assembly Takes Over Legislature’s Duties.” New York Times. August 18, 2017. https://www.nytimes.com/2017/08/18/world/americas/venezuela-constituent-assembly-maduro.html. Charbonneau, Louis, and Mirjam Donath. “U.N. General Assembly Declares Crimea Secession Vote Invalid.” Reuters. March 27, 2014. https://www.reuters.com/article/us-ukraine-crisis-un/u-n-general-assembly-declares-crimea-secession-vote-invalid-idUSBREA2Q1GA20140327. Center for Strategic & International Studies. February 22, 2018. https://www.csis.org/analysis/russias-national-oil-champion-goes-global. Chu, Ben. “Venezuela: How the most oil rich nation on earth was brought to the brink of collapse.” The Independent. August 18, 2018. https://www.independent.co.uk/news/business/analysis-and-features/venezuela-nicolas-maduro-economy-crisis-oil-prices-explained-history-hugo-chavez-a8494696.html. Desjardins, Jeff. “From Richer to Poorer: Venezuela’s Economic Tragedy Visualized.” The Money Project. September 5, 2017. http://money.visualcapitalist.com/richer-poorer-venezuela-economic-tragedy/. Ellis, R. Evan. The New Russian Engagement With Latin America: Strategic Position, Commerce, and Dreams of the Past. Carlisle, PA: U.S. Army War College Press, 2015. Farah, Douglas and Liana Eustacia Reyes. “Russia in Latin America: A Strategic Analysis.” National Defense University. https://cco.ndu.edu/Portals/96/Documents/prism/prism_5-4/Russia%20in%20Latin%20America.pdf. Gedan, Benjamin N. “China’s Venezuela Policy Is Losing Popularity – in China.” Americas Quarterly. November 27, 2018. https://www.americasquarterly.org/content/change-coming-chinas-venezuela-policy. Henderson, James. “Rosneft – On the Road to Global NOC Status?” The Oxford Institute for Energy Studies. January, 2012. https://www.oxfordenergy.org/publications/rosneft-on-the-road-to-global-noc-status-2/. Hirst, Joel D. “A Guide to ALBA.” Americas Quarterly. Accessed December 18, 2018. Kolyandr, Alexander. “Lukoil Sells Stake in Venezuela Project to Rosneft.” New York Times. December 23, 2014. https://www.wsj.com/articles/lukoil-sells-stake-in-venezuela-project-to-rosneft-1419357721?ns=prod/accounts-wsj. Krauss, Clifford. “Russia Uses Its Oil Giant, Rosneft, as a Foreign Policy Tool.” New York Times. October 29, 2017. https://www.nytimes.com/2017/10/29/business/energy-environment/russia-venezula-oil-rosneft.html. “Maduro otorgó premio ‘Hugo Chávez a La Paz” a Vladimir Putin.” El Nacional. October 7, 2016. http://www.el-nacional.com/noticias/politica/maduro-otorgo-premio-quothugo-chavez-pazquot-vladimir-putin_1784. Mohammed, Arshad and Bill Trott. “U.S. intensifies sanctions on Russia over Ukraine.” Reuters. O’Donnell, Thomas W. “Russia Is Beating China to Venezuela’s Oil Fields.” Americas Quarterly. 2016. https://www.americasquarterly.org/content/russia-beating-china-venezuelas-oil-fields. “Oil Production Starts at the Junin-6 Block in Venezuela.” Gazprom Neft. September 27, 2012. Parraga, Mariana and Alexandra Ulmer. “Vladimir’s Venezuela – Leveraging loans to Caracas, Moscow snaps up oil assets.” Reuters. August 11, 2017. https://www.reuters.com/article/us-venezuela-russia-oil-specialreport/special-report-vladimirs-venezuela-leveraging-loans-to-caracas-moscow-snaps-up-oil-assets-idUSKBN1AR14U. Restrepo, Dan. “Venezuela in Crisis: A Way Forward.” Center for American Progress. October 16, 2018. https://www.americanprogress.org/issues/security/reports/2018/10/16/459352/venezuela-crisis-way-forward/. Romero, Simon. “Venezuela Says It Will Buy Russian Missiles.” New York Times. September 13, 2009. https://www.nytimes.com/2009/09/13/world/americas/13venez.html. “Rosneft Increases Stake in Petromonagas JV with PDVSA.” Rosneft. February 20, 2016. Semple, Kirk. “Venezuela’s Two Legislatures Duel, but Only One Has Ammunition.” New York Times. November 3, 2017. https://www.nytimes.com/2017/11/03/world/americas/venezuela-national-assembly-maduro.html. Shuster, Simon. “Exclusive: Russia Secretly Helped Venezuela Launch a Cryptocyrrency to Evade U.S. Sanctions.” Time. March 20, 2018. http://time.com/5206835/exclusive-russia-petro-venezuela-cryptocurrency/. Ulmer, Alexandra, Eyanir Chinea, and Vladimir Soldatkin. “Venezuela, Russia’s Rosneft Agree on $14 Billion Oil, Gas Investment.” Reuters. May 27, 2015. https://www.reuters.com/article/us-venezuela-russia/venezuela-russias-rosneft-agree-on-14-billion-oil-gas-investment-idUSKBN0OC2YF20150528. “Venezuela’s Maduro Announces Billions Of Dollars in Russian Investment.” RadioFreeEurope. December 2018. https://www.rferl.org/a/venezuela-s-maduro-announces-billions-of-dollars-in-russian-investment/29641832.html. Wolland, Jeremy. “Venezuela, Russia Sign Weapons Deal.” Arms Control Association. September 1, 2006. https://www.armscontrol.org/act/2006_09/VenRussia. Zennie, Michael. “Here’s Why Russian Bombers Are in Venezuela. And Why the U.S. Is So Angry About It.” Time. December 13, 2018. http://time.com/5478644/venezuela-russian-bombers/. “Maduro otorgó premio ‘Hugo Chávez a La Paz’ a Vladimir Putin.” El Nacional. October 7, 2016. http://www.el-nacional.com/noticias/politica/maduro-otorgo-premio-quothugo-chavez-pazquot-vladimir-putin_1784. Hirst, Joel D. “A Guide to ALBA.” Americas Quarterly. Accessed December 18, 2018. https://www.americasquarterly.org/hirst/article. Blomfield, Adrian. “Chavez in Russian Arms Factory Deal.” The Telegraph. June 1, 2006. https://www.telegraph.co.uk/news/worldnews/southamerica/venezuela/1520035/Chavez-in-Russian-arms-factory-deal.html. Allen, Kate, Henry Foy and John Paul Rathbone. “Russia and Venezuela agree $3bn debt restructuring.” Financial Times. November 15, 2017. https://www.ft.com/content/5f3084c6-ca03-11e7-ab18-7a9fb7d6163e. “History of Rosneft.” Rosneft. December, 2018. https://www.rosneft.com/about/History/. Chow, Edward C. and Andrew J. Stanley. “Russia’s National Oil Champion Goes Global.” Center for Strategic & International Studies. February 22, 2018. https://www.csis.org/analysis/russias-national-oil-champion-goes-global. “Oil Production Starts at the Junin-6 Block in Venezuela.” Gazprom Neft. September 27, 2012. https://www.gazprom-neft.com/press-center/news/612514/. Mohammed, Arshad and Bill Trott. “U.S. intensifies sanctions on Russia over Ukraine.” Reuters. September 12, 2014. https://www.reuters.com/article/us-ukraine-crisis-usa-sanctions-idUSKBN0H71N320140912. Rapoza, Kenneth. ‘How Russia’s Largest Companies Have Weathered Sanctions.” Forbes. June 6, 2018. https://www.forbes.com/sites/kenrapoza/2018/06/06/2018-global-2000-how-the-biggest-russian-companies-have-weathered-sanctions/#1f9a66172d90. “Rosneft Increases Stake in Petromonagas JV with PDVSA.” Rosneft. February 20, 2016. https://www.rosneft.com/press/releases/item/180807/.